Following the famous Great Ocean Road not far west of Melbourne you'll find Lorne, one of the most popular beach holiday destinations in Victoria, Australia. Each January they hold a 1200m swimming race affectionately known as the "Lorne Pier to Pub". It's taken too with zeal by thousands of contestants. 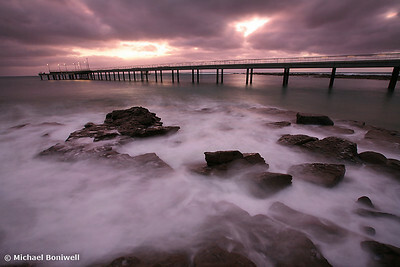 This shot was taken in November of the aforementioned Pier just as the sun was rising.